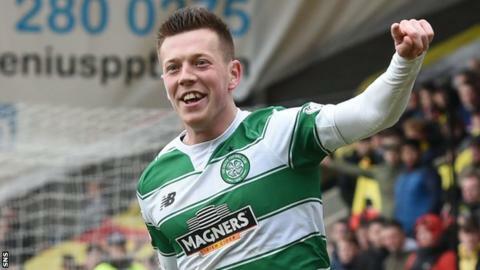 Callum McGregor says that he wants to "keep repaying the faith" shown in him by Celtic manager Ronny Deila. The midfielder was convicted last month for drink driving and spent several weeks out of the starting line-up. Since his return, he has impressed with his performances and scored two goals in the last three games under Deila. "He's always stuck by me," McGregor said. "Hopefully we can continue that relationship and I keep doing it on the park for him." McGregor received a one-year driving ban and a £500 fine after being stopped while almost four times over the alcohol limit. He missed five games while waiting for his court case, but Deila remained supportive of the player and encouraged him to come back stronger. "I spoke to him after it happened," McGregor said. "We had a chat and he said to keep my head down and work hard. "So I felt, after that conversation, that there was a way back in and it was up to me to try to do that. "He was the first one to give me my chance, which shows that he thinks a lot of me. I think a lot of him as well." McGregor admits that, as he tries to establish himself as a regular in the Celtic starting line-up, making the step up to the national squad is the next ambition. He has been selected for previous squads by Scotland coach Gordon Strachan but has yet to earn a full cap. "I'm disappointed not to be in the squad," McGregor said. "I know there are a few boys who have done well and deserve to be there, so all I can do is keep trying to do the business on the park and hopefully get there in the end. "For me now, it's to try to kick on and play as many games for Celtic. Hopefully the next stage is the international stage. That's where I want to be." Having failed to make the squad for Celtic's Scottish League Cup semi-final win over Rangers last season, the midfielder is eager to be involved when the sides meet again at Hampden in the Scottish Cup semi-final next month. "It was hard," he admitted. "The big games are the ones that you want to play in. "The manager made his decision on the day and you've just got to deal with that. "Hopefully I can do everything I can to be involved this year. "As long as I continue to work hard and do my stuff on the pitch, there's no reason why not. "It's the manager's call. Whatever he thinks is best is best for the team."